The latest exhibition by Nacho Martín Silva, Tirar del hilo hasta quedar ciego (‘Pulling on the Thread till You Go Blind’), uses the option to create intuitive knowledge through the combination of simultaneous iconographies. The artist’s research on dissenting events, border stories and heterogeneous narrative worlds coexist with the exploration of the cultural, social and ideological implications that link the individual to the fringe of his canonical identity. 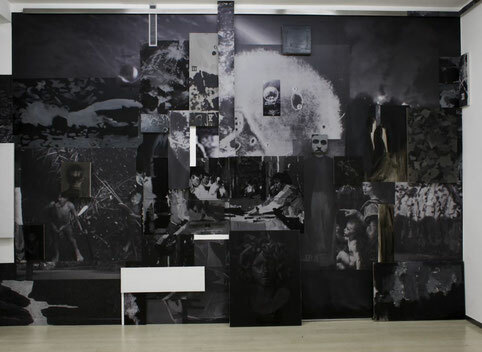 Nacho Martín Silva incorporates this inventory of images by means of different material records: vinyl, photographic paper prints and, above all, his own pictorial account, which is distinctive but also oscillating between the mere sketch, the carnality of oil paint and the finesse of the detail. A variety of material resources, complementary and opposite, provides with one of the fundamental keys to this installation: its dramaturgy is based, chiefly, on a compositional organisation of technical and iconographic conflicts that disrupts any indulgent relationship with the spectator. The possible unity of the work is delayed with the intricacies of a multifocal narrative that wanders, without being exhaustive, across Antonioni, Degas, Leonardo, Sputnik, the dark side of the moon and the invisible men of the Amazon. In the rip that comes from the cross between the fantastic and the real, anxiety appears, the delirium that Freud would define through the idea of the uncanny, after reading the short story by E.T.A Hoffmann, `The Sandman’, which refers to the return of the repressed and the strangely familiar but also connects with the fear of losing the eyes. In 1923, four years after Freud’s ‘The Uncanny’, Russian filmmaker Sergei M. Eisenstein published the essay ‘Montage of Attractions’. There, he describes his idea of the cinematographic montage as a device for the production of correlated meanings, arising from the encounter or conflict between the elements, forms and proportions that are contained between two images that are projected side by side. There is a similar poetics to be found in Nacho Martin Silva’s installation, based on the functionality of the collision as a narrative device: he works with contrast, confrontation, syncopation and conflict in order to create tension, intensification and, above all, the spread of multiple meanings that are being fabricated right before our eyes. In short, Nacho Martin Silva’s work aims to operate as an efficient antidote against blindness.